The next set of commands comes from the Curve Menu. Some are duplicated on the Patch Tool Bar. This creates the simplest cylinder. Cylinders are always drawn with their open ends facing up and down. It does not matter which map view is open when the cylinder is created. This is a cylinder with a set of extra rows. It allows a 180-degree bend into a half donut (half torus). This is a cylinder with two extra sets of rows. This allows a bend into a full donut (torus). This is a cylinder whose columns have been adjusted so that a square, with flat sides, is formed. This is a half cylinder. This is an endcap without the backside removed. A cone is a cylinder with control points drawn together and welded at one end to form a point. Design Note: A curve patch sphere can be constructed from a cone. Start with a cubic brush. Convert into a cone. Go into edit vertexes mode and grab the control point at the peak of the cone. Pull it downward to half the height of the cone. Clone the resulting piece and flip it upside down. The patch mesh is the basic building block use to create all curves. All the curve primitives are deformations of this item. For this to work, you must first create a brush of the dimension desired for the patch. Selecting this opens a Patch dialogue window. This lets you select the vertical (rows) and horizontal (columns) complexity of the patch. The more complexity means being able to perform more deformations on the patch. It also means adding a greater number of triangles that must be rendered. Adding control points increases the complexity of a mesh. This action does not increase the physical size of a mesh. Additions are usually done before manipulating the patch mesh. This adds two columns of control points to the left edge of a patch. This adds two columns of control points to the right edge of a patch. This adds two rows of control points to the lower edge of a patch. This adds two rows of control points to the upper edge of a patch. Deleting control points reduces the complexity of a patch mesh. Be warned that the features created by the removed points are also removed. It does not make the mesh a less complex version of the former design. Deletions also change the dimensions of the mesh, removing the area created by the deleted control points. A mesh cannot be reduced smaller than a 3 column by 3 row complexity. This removes two columns of control points from the left edge of a patch. This removes two columns of control points from the right edge of a patch. This removes two rows of control points from the lower edge of a patch. This removes two rows of control points from the upper edge of a patch. This has nothing to do with Neo and Trinity. It's the patch mesh taken as a whole. This command inverts the normals of the patch mesh. The normals control the direction of facing for the texture skin and the clipping surfaces. This is used on a selected patch. When rows or columns are inserted or added to a patch, the dimensions of the patch are not changed. The distances between the new additions and the old points are not the same. This command averages out the distance between the points. It does not change the size of the patch. WARNING! Only apply this BEFORE adjusting the patch. Otherwise, you may lose your work on it. With some patches, selecting this command will destroy the patch itself. The distance between columns is averaged and evened out. The distance between rows is averaged and evened out. Cylinder The ends of the cylinder are sealed with circular patches. Square Cylinder The ends of the cylinder are sealed with square patches. Cone Both ends are capped (open and point). You will want to discard the cap on the point end. Bevel If you select to cap a bevel, a dialogue window pops up. 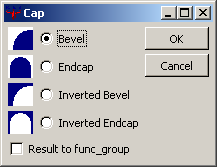 A normal bevel cap covers the space between the curve and the center. Inverted Bevel An inverted bevel covers the space between the curve and the outer corner. Endcap If you select to cap an endcap, the same dialogue window pops up. Patch Mesh The bevel/endcap window will pop up. Results will vary depending on the manipulations done to the mesh. Press this repeatedly until the texture on the cap patch looks correct. This is used on a selected patch. When rows or columns are inserted or added to a patch, the dimensions of the whole patch are not automatically adjusted. The distances between the new additions and the old points are not the same. This command averages out the distance between the points. WARNING: Only apply this BEFORE making adjustments to the patch, otherwise you may lose your work on it. With some patches, the patch itself will be destroyed. This is used on a selected patch. Messed Up Texturing: If an inverted bevel endcap covers something other than an arc of a perfect circle, it is likely that the texture won't appear right when you apply the CAP function to the texture. Press SHIFT + CTRL + P a few times until it looks right. (Patch Control Bar only) This feature, when selected (button pressed in) causes control points to weld together if they are moved to the same coordinates. Undo will undo the move and the weld. When this is toggled on (depressed), clicking on a control point in a 2D Map view selects all the control points in the row or column beneath it. These keys move the curve patch around the map in discrete map grid increments. Each press moves the selected map component down along the Z-axis by one grid position (at current grid setting). Not affected by current 2D-map view. Each press moves the selected map component up along the Z-axis by one grid position (at current grid setting). Not affected by current 2D-map view. These keys move the curve patch around the map in discrete map grid increments. The movement is in terms of the selected window, not in terms of XYZ coordinates. Each press moves the selected map component "down" the map view by one grid position (at the current grid setting). The movement is relative to the selected map view, not XYZ coordinates. Each press moves the selected map component "up" the map view by one grid position (at the current grid setting). The movement is relative to the selected map view, not XYZ coordinates. Each press moves the selected map component "left" the map view by one grid position (at the current grid setting). The movement is relative to the selected map view, not XYZ coordinates. Each press moves the selected map component "right" the map view by one grid position (at the current grid setting). The movement is relative to the selected map view, not XYZ coordinates. If you are using the map grid to keep curve patches in alignment, this is a great tool. Rotated curve patches and curve patches that have had their vertices tweaked can have vertices that no longer lie on map grid intersections. This snaps the vertices to align with the grid. Be warned that snapping to large grids may be hazardous to the health of your curve patch (Snap and it's gone! But that's what UNDO is for).